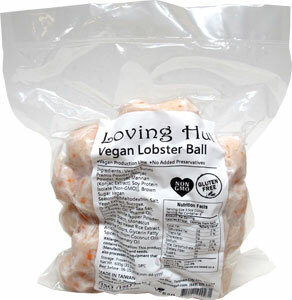 Perfect for making vegan sushi, tempura, pasta dishes or awesome appetizers, you'll have no limits to your options with these tasty vegan "lobster" chunks from Loving Hut! With a taste and texture amazingly similar to the real thing (but 100% vegan, of course! ), they're made with non-GMO ingredients and will give you plenty of new options at mealtime. 14 oz. (600g) package is $14.99. From TIM MCGRATH of WATERTOWN, Massachusetts on 10/2/2018 . I so wanted to love this product, however it is horrible. Like eating gross tasting little rubber bouncy balls. I tried it warm with vegan butter and cold with vegan mayo as a "lobster roll". It is nothing at all like lobster, not in taste which is terrible and not in texture which is worse than over cooked octopus. So bad. Epic Fail! From Elena of Syracuse, New York on 2/21/2018 .